Feb 13, 2011, 1:40 PM: That's a wrap! Look for our hands-on later today. Feb 13, 2011, 1:39 PM: Going over the launch gaming titles, for the zillionth time. 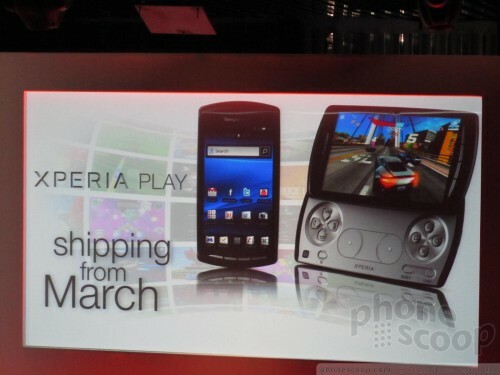 Feb 13, 2011, 1:36 PM: Xperia Play coming to the US first, in "early spring", with Verizon Wireless. In March around the world. Feb 13, 2011, 1:32 PM: Guitar Hero. Assasin's Creed. Dead Space. Reckless Racing, Fifa Mobile with multiplayer, Galaxy on Fire. 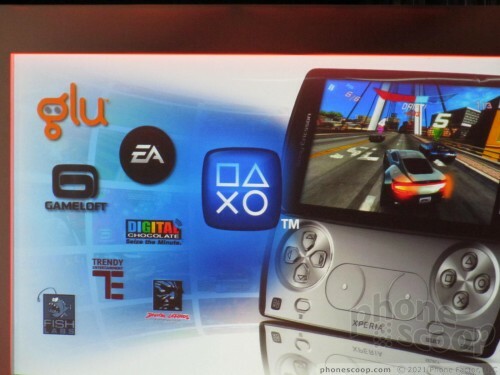 Feb 13, 2011, 1:31 PM: 50 game titles at launch, from 20 partners, including EA, Gameloft, and Glu. Feb 13, 2011, 1:30 PM: Multi-player gaming. Feb 13, 2011, 1:28 PM: "true HD" game graphics at 60 fps. Feb 13, 2011, 1:26 PM: Revamped TimeScape. Built-in SE media player. Two cameras. Feb 13, 2011, 1:25 PM: Only promising one game title preloaded - and available - on Xperia Play when it ships (until the Store launches.) Can that be right? Feb 13, 2011, 1:24 PM: PlayStation Store with PlayStation content will be launching "by end of year". 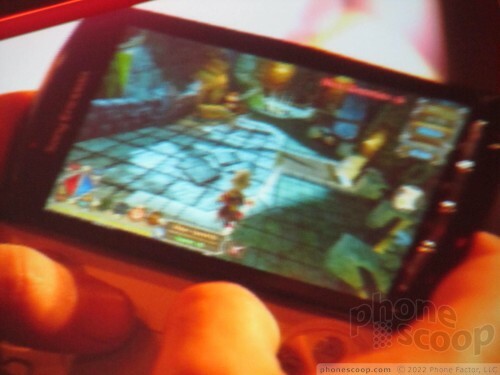 Feb 13, 2011, 1:20 PM: Sony Ericsson's gaming work on Android is being contributed back to Google. Feb 13, 2011, 1:17 PM: Not that you haven't seen it, but here's the photo anyway. 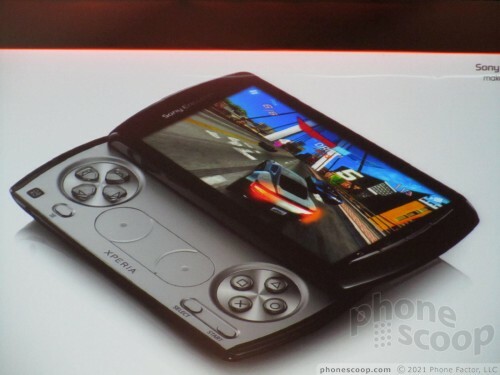 Feb 13, 2011, 1:16 PM: Xperia Play: slide-out gaming controls. Android Gingerbread. "PlayStation certified". Feb 13, 2011, 1:14 PM: Here we go. 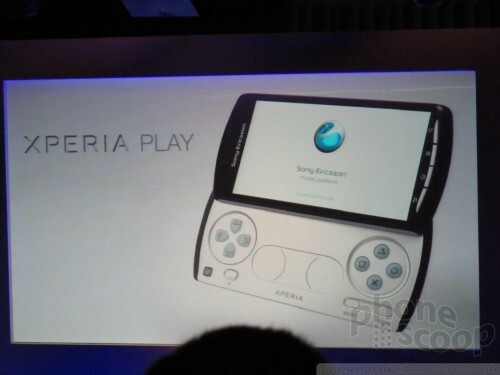 Xperia Play. Feb 13, 2011, 1:13 PM: The slider mechanism is also "smart", so that viewing an email, sliding it open starts a reply. Feb 13, 2011, 1:13 PM: Unique split-screen email view lets you use as much of the screen for message vs. list as you like. 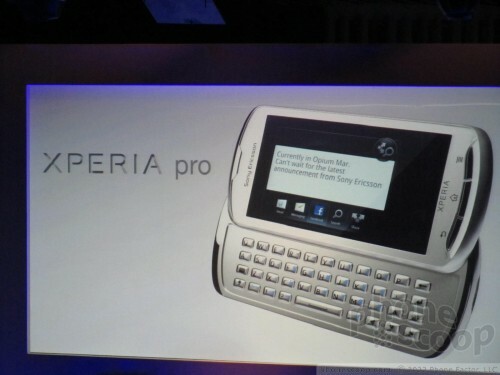 Feb 13, 2011, 1:11 PM: Xperia pro: side-slide keyboard, HD video capture, HDMI, "inspired by the Xperia Mini Pro". Easy messaging + multimedia. Feb 13, 2011, 1:09 PM: Like the arc, you can use the remote on your Sony TV to browse through photos when the phone is connected to your Sony TV. Feb 13, 2011, 1:09 PM: Demo time. You can create folders of apps on your home screen, using the same basic UI as an iPhone. 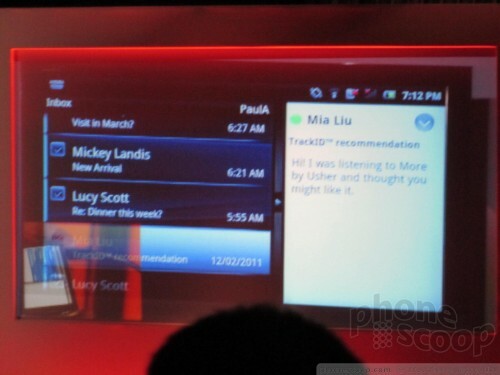 Feb 13, 2011, 1:07 PM: Like the arc, you can pinch the home screen to see all widgets grouped together. 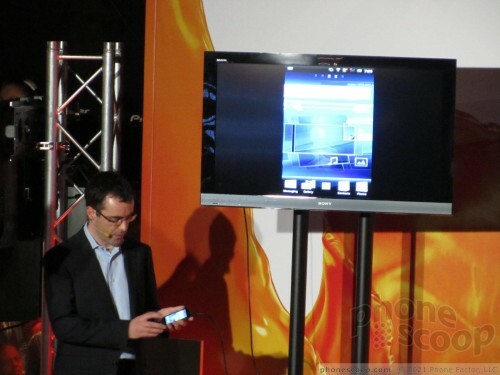 Feb 13, 2011, 1:06 PM: Xepria Neo using the "latest" version of Android. 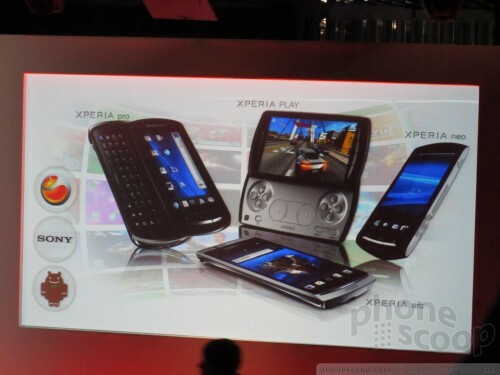 Feb 13, 2011, 1:05 PM: Xperia Neo: 8-megapixel camera, HD video camera, and HDMI. 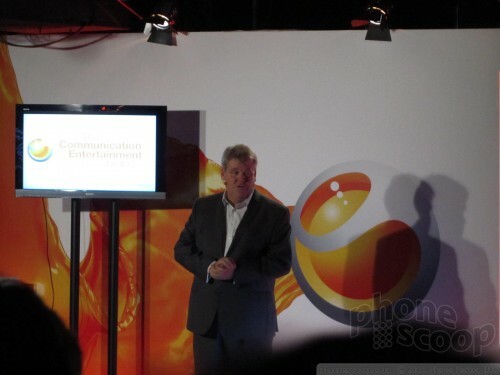 Feb 13, 2011, 1:04 PM: Cathy Davis and Tony McNulte are on stage to do the product announcements. 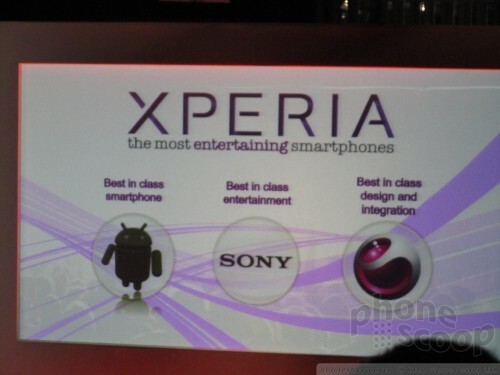 Feb 13, 2011, 1:02 PM: Talking about the Xperia arc. Feb 13, 2011, 1:02 PM: The CEO is starting his welcome and year-in-review comments. 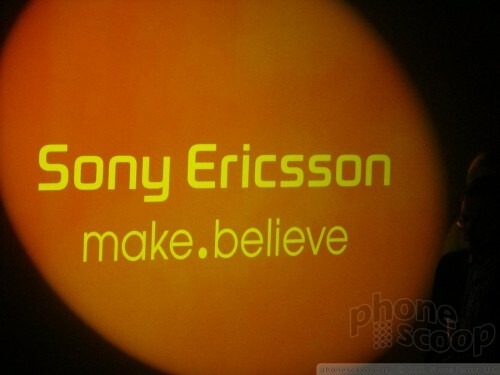 Feb 13, 2011, 12:57 PM: The Sony Ericsson event starts in 5 minutes. Follow our liveblog for the play-by-"play". Feb 13, 2011, 12:39 PM: We should be getting started in 5-20 minutes. Feb 13, 2011, 12:36 PM: We're seated and ready to... play? This phone looks amazing. Of course Verizon would get it. I wonder how many ATT customers are going to start a new contract just for the gaming aspect. As dumb as that would be, I wouldn't put it past anyone. "Of course Verizon would get it"? 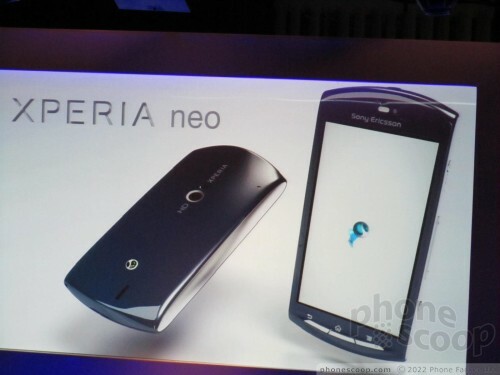 Sony Ericsson, to this point, has been exclusive to GSM carriers. Everyone expected AT&T or T-Mobile to get this!